If you are an art follower you may have already heard about the One Day Sculpture project. One Day Sculpture was launched in Wellington in March 2008 in conjunction with the New Zealand International Arts Festival. Since then there have been 7 projects presented. These were all commissioned by different institutions around Aotearoa/New Zealand and have taken place in Auckland, Hawera, Wellington and Dunedin. Each project has been really different. So far there has been a huge barricade blocking off Stout Street in Wellington, a festival for writer Ronald Hugh Morrieson and boat rides to Quarantine Island / Kamau Taurua in the Otago Harbour. Organised by the Litmus Research Initiative at Massey University School of Fine Arts in Wellington and British Curator Claire Doherty, One Day Sculpture is a series of temporary public art works in several locations around New Zealand. One thing the projects do have in common is that they all occur within one 24 hour period or one calendar day from midnight to midnight. Some of the projects take up the whole 24 hours while others go for several hours within the specified day. Each project can also be at any public location and often the artists’ intention is to surprise people with an artwork so that you might simply stumble across a work in progress on your lunchbreak or on your way home from work. There are more projects coming up in February and March in Wellington, Auckland and New Plymouth and a Symposium hosted by Te Papa on March 26-28. The One Day Sculpture website has a whole host of information about the Symposium, past and upcoming projects and about the One Day Sculpture idea itself. James Luna’s mihi at Te Papa on 27 January. 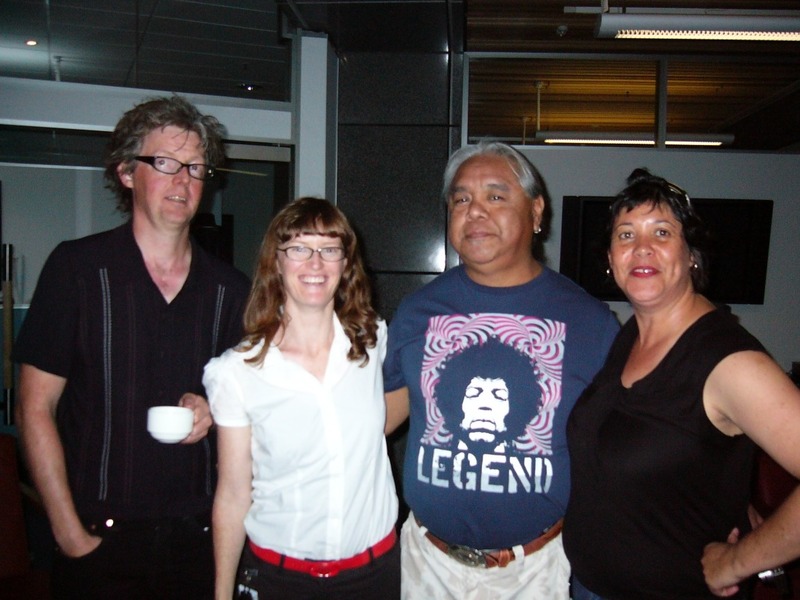 L-R David Cross, Charlotte Huddleston, James Luna, Megan Tamati-Quennell. Te Papa is not only the host venue for the Symposium; we are also commissioning a project for the series. Megan Tamati-Quennell, curator of contemporary Maori and Indigenous art, and me – Charlotte Huddleston, curator of contemporary art – are working with Native American artist James Luna. James is Luiseño Indian from the La Jolla Reservation near San Diego, California. James is here in New Zealand now researching for his project and in the next couple of weeks Megan and I will be travelling around Aotearoa/New Zealand introducing James to some of our great places and people. We will be posting new entries as we go so stay tuned.